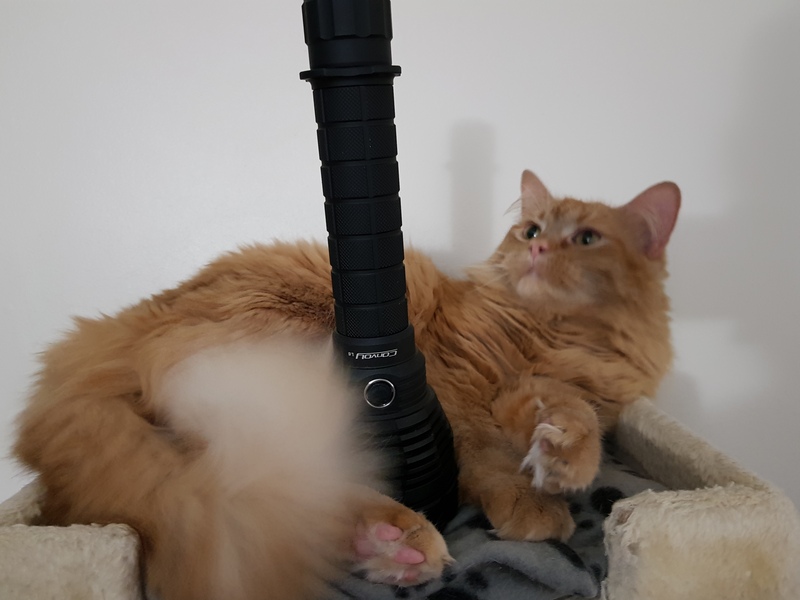 I was curious about the difference between the C8A and C8T, so naturally had to get both from 77 Outdoor to add to my already large C8 Army™. Of Sofirn’s C8s, I already have a few C8Fs, from the first-generation 18650 lights with XP-G2s, to the newer model with XP-L2s, to the newest model which takes 21700 cells, all hella impressive, so I’m already familiar with Sofirn lights and C8s in general. The ‘A and ‘T are two nice additions to the family (or army). Given the descriptions, I was given to understand that based on the emitters, the ‘A belts out more light more efficiently, over a wider hotspot, whereas the ‘T concentrates the light into a smaller hotspot for greater throw at the expense of some absolute light output, and I was correct. So a nice mnemonic would be C8A for absolute, and C8T for throw. Unlike most C8 variants, the ‘A and ‘T are both devoid of any knurling, giving a nice smooth sleek look. They rely on the shape of the body and tailcap for grip, and it works quite well. The knobby tail (and of course the head) keeps the light from slipping out of your hand. All in all, it’s a nice change of pace from the usual square-cut or diamond-cut knurling that seems to be on every light in existence. It’s not better or worse, just different. Anyway, unboxing both was like Christmas morning for me. Nice hefty lights, 18650 cell included inside the light, along with the charger, cable, packet of spare O-rings, and the user’s manual. Just eyeballing the lights, you can see they ooze quality, from the hefty solid feel, to perfect anodisation, nice solid clicks of the tailswitch, and perfectly mirrored reflector (not even a speck of dust, let alone fingerprints). They’re supposed to have AR-coated glass, but I didn’t notice any telltale hue when looking at the glass from an angle. Just as well, as AR-coated glass sometimes imparts a nasty greenish tint to the beam, which these thankfully don’t have. Flicking on both lights, my guess was spot-on. Ceiling-bounce showed the ‘A to be a bit brighter, visually, but the ‘T concentrates the light into a tighter hotspot for more throw. If you want to spot owls in trees, go for the ‘T, as you’d be hard-pressed to find a better compact light that throws as well, but spotting what’s in the backyard, the ‘A would probably be the better general-purpose light. They’re both hella bright, though, make no mistake. Oh, and I was using the cells as they came from the factory, not charged. If the lights could light up the whole room at an almost-dead 3.4V or so, I can only imagine how bright they’d be at a topped-off 4.2V. No artifacts in the beams, just cozy white hotspots, a bit of a yellowish corona in each, and slightly bluer spill. Nothing objectionable at all, which is nice. A slightly bluish dot in the center of the hotspot in the ‘T tells me everything’s perfectly in focus, as it’s the same dot I see in my GT Micro and other tight-focus lights. To me, that’s a good sign. I admit, I’m biased, as I’ve had good experiences with Sofirn lights, and the ‘A and ‘T don’t disappoint. Expect good things from these lights. For the price, just the lights themselves would be a good value, but the kit (charger/cable/cell) makes it a bargain. I’m running the cells now to do a capacity test, and expect close to or over the rated 3000mAH. The 4-pack of Sofirn 21700 cells I got for my C8Fs are rated 4000mAh, and 3 of 4 were almost 4100mAH, only 1 was just short of 4000, around 3950mAH. So the included cells are not the usual CrapFire recycled cells that come with cheap lights, but fresh-from-the-factory cells. All in all, highly recommended. They’re not quite pants-pocket lights, but certainly jacket-pocket lights, nightstand lights, etc. Useful right out of the box, no “tweaking” needed. Addendum: both cells clocked in at about 2950mAH and 2970mAH, just a hair’s breadth shy of the rated 3000mAH in my Mighty Opus. Pix probably later; will have to stick ‘em on Amazon and then link to them here. C’mon! No love for “regular” C8s anymore? I remember when getting to 1000lm in even a C8 was a Big Deal, and you needed to pay for a XinTD for any decent quality and output. Now you got almost double that in a single-emitter light, and… nothing? I’m working on it… I’m working on it. Funny thing is, aside from the “C8A” and “C8T” inscribed on the lights, they’re pretty much identical twins. Only the view of the LEDs would be different (HI vs HD). Ask in http://budgetlightforum.com/node/63086 if any Easter codes might exist? I recently got a Sofirn C8A because I was looking for a more all-around light with a good amount of throw compared to my collection of tube lights. This Sofirn is simply a very nice package. I also went with the three mode UI to avoid strobe and I like it quit a bit. Not nearly as flashy as some but you can’t deny the usefulness. I especially appreciate how nothing is glued on this light AND it’s got retaining rings fore and aft. Not that I’m looking to mod it (I like it in its stock form just fine) but those who might want to will have an easy time of it. I’m glad that it’s got the single tail switch too. I’ve never been comfortable with a dual switch light. I can see that some might like it for more tactical situations, but I hated having to switch hand positions. This avoids that and I prefer it. I recently got a Sofirn C8A because I was looking for a more all-around light with a good amount of throw compared to my collection of tube lights. This Sofirn is simply a very nice package. I also went with the three mode UI to avoid strobe and I like it quit a bit. Not nearly as flashy as some but you can't deny the usefulness. I especially appreciate how nothing is glued on this light AND it's got retaining rings fore and aft. Not that I'm looking to mod it (I like it in its stock form just fine) but those who might want to will have an easy time of it. I'm glad that it's got the single tail switch too. I've never been comfortable with a dual switch light. I can see that some might like it for more tactical situations, but I hated having to switch hand positions. This avoids that and I prefer it. Thanks for the review Bringer of Light. I'm waiting on a C8F 21700 Host. Not quite sure how to build it yet, but I'm cogitating on it and reading a lot. It’s a great jacket-pocket light, more throw than a VG10/SF36, and better heat-handling. So for quick treks outside (walking the dog, etc. ), it’s really handy. Big big big plus right there!